No. 613 Squadron Spitfires F Mk. XIV at RAF Ringway in 1947. No. 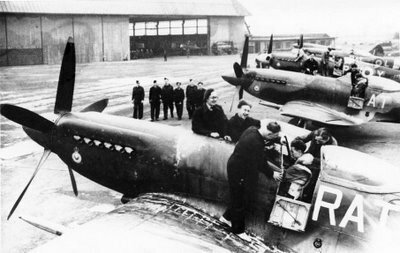 613 (City of Manchester) Squadron was the RAuxAF squadron formed on 1 March 1939 at the new municipal airport at Ringway near Manchester. Durign the war it had a diversified career operating an array of reconnaissance aircraft types, ranging from Hectors and Lysanders through Curtiss Tomahawks and Mustangs Mk. I to the Mosquitoes. The Spitfires came inot the unit’s inventory only post-war, when the squadron was reformed, once again at Ringway, as a fighter squadron within Reserve Command and with the new code letters “RAT”. They were equipped with Spitfires Mk XIV. The unit operated both the high and low-back variants of this mark. For example, the third aircraft in the line is most probably RM851, a high-back Mk. XIVe. On 12 August 1948 this aircraft ran onto soft ground on attempted overshoot and tipped up, being subsequently struck off charge. The Spitfires Mk. XIV were replaced in November 1948 by the higher performance Mk. 22, and the unit continued to operate the Spitfire until February 1951, when these well-tried aircraft finally had to give way to jet powered de Havilland Vampires FB.5.